My husband Will and I have been struggling to get a full night’s rest for the past week or two due to a couple big factors. One, we’re sleeping in someone else’s home, and sleeping in a place that’s unfamiliar is always a difficult adjustment to make. And two, as I’ve stated many times to the point of sounding like a broken record, it’s very hot, and we spoiled AC kiddos haven’t entirely gotten used to that yet. Every day that we don’t get a full night’s rest, we get a little crankier, and a little more ill-feeling. Last night Will and I spent a wonderful evening with Austrian friends at their home in Donaustadt. 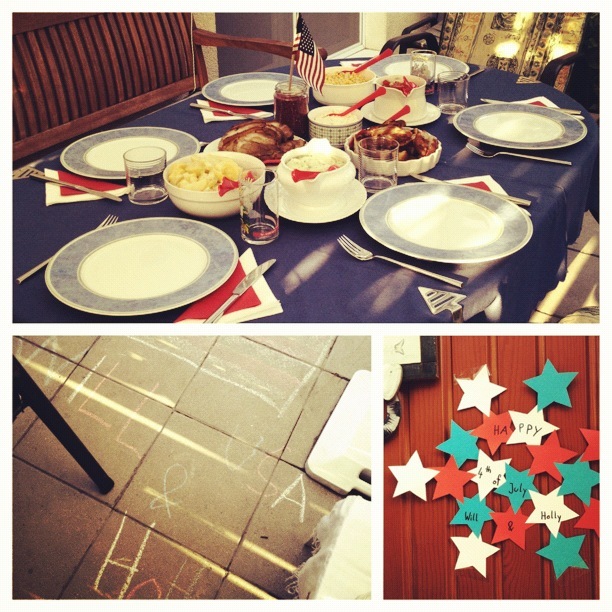 We had a traditional Austrian meal complete with 4th of July decorations made for us by their precious children. We ate and talked and before we knew it, it was 11:30pm. Will and I headed back to Leopoldstadt and arrived in our apartment around 12:15am or so, then immediately jumped on Skype to wish my mom a very Happy Birthday. We talked with my parents till about 1:00am, went to bed, and I think I woke up about 4 or 5 times throughout the night, each time dripping with sweat. We woke up at 7:00am this morning in order to make it to the office by 8:30am. I was especially excited about today because my American friend Amanda who has lived here for 5 years was taking me to a Viennese thrift store to help me shop for inexpensive but awesome finds for my new apartment. While I was getting ready, my stomach was hurting just the tiniest bit, but I attributed it to the lack of sleep and feeling overheated. Will didn’t feel very well either, but we both filled up bottles of water and made it to the office on time. Unfortunately, by the time we made it to the office, I felt myself going downhill. I was hot, dizzy, and felt like I was going to toss up last night’s schnitzel at any moment. But my strong desire to thrift shop with Amanda trumped my need to lie down somewhere preferably near a trashcan and 500 fans, so we got in the car ready to thrift. It didn’t take long for me to realize that perhaps thrifting should have waited another day. The AC was blasting cold air on me, I was sipping water constantly, and I tried describing my new apartment to her in full detail, but I was only able to describe the entrance and kitchen before realizing that talking wasn’t a good idea. I looked around and asked Amanda if there was a bag around in the total off chance that I needed to throw up. The only thing she could find was a small diaper bag that had a hole in the bottom. I took the bag but was still convinced that the massive heatwave I was experiencing would pass and I would be able to talk and thrift without a problem. We arrived at the thrift store and my sickness had still not disappeared. In fact it was worsening. The antique vases all blended together in one blurry colorless form. The furniture I so badly wanted to look at only resembled 40 different places for me to collapse. I think we had been in the store for less than 5 minutes before I dismissed myself to WC (watercloset, bathroom). After some minutes of being convinced of my demise inside a tiny WC with a cleaning lady on the other side of the door, nothing happened. While I was a tad frustrated that I wasn’t getting sick where it was convenient, I was also a little relieved. Will says that hearing me throw up is one of more terrifying things he’s experienced and that I sound like a Velociraptor, so with that in mind, I didn’t want to unleash my dinosaur-like characteristics in a small thrift store warehouse and scare everyone away. I gave up and met back up with Amanda and we both decided that thrifting would have to wait its turn, so we got back in the car with both of us now in a little bit of a hurry to get back to the office. This time I rode with my eyes closed. The tiny diaper bag was clutched firmly in my hand as I tried to swallow as much cold air as possible. The last thing I heard was Amanda asking how our cat was – I said, “He’s good…” and that was it. I didn’t miss the bag so much as I… overwhelmed the bag. In three coughs, my dress was no longer pretty, the passenger side was no longer clean, and I felt 100 times better. Obviously I felt horrible about making such a gross mess in Amanda’s car, and on our thrifting date too. She pulled over in a grocery store parking lot in order to equip me with actual bags, tissues, and kitchen cloths. I cleaned myself up as best I could and spent the rest of the ride back apologizing and picturing Will’s face at the sight of my newly decorated self. I haven’t thrown up since but did end up sleeping for over 5 hours straight this afternoon. We’re still not sure what I came down with for those 3 brief hours other than simply lack of sleep and too much heat. My pride is a little wounded but I’m feeling better and enjoyed two more episodes of Planet Earth with my husband. Hopefully next time’s thrifting date won’t be quite as exciting as it was today. It’s a wonderful life, with cats and friends and diaper bags and vomit and everything. Until you get used to the heat try a mesh hammock with a fan blowing underneath you. Thats what the boy scouts do! It truly is. Thanks for the tip! We tried to buy a fan yesterday at Hornbach but they were completely sold out! Right now we’re the hottest city in Europe so everyone is buying fans left and right. Hopefully we can get one this weekend. But don’t worry – we’ll have fans setup in our living room when you and Clyde visit. Love you too! Hilarious (at least from a distance and without my car involved). Thanks for keeping us updated and I hope you are feeling much better now.